Before the month slips away from me, I going to push some of my jewelry in your face. 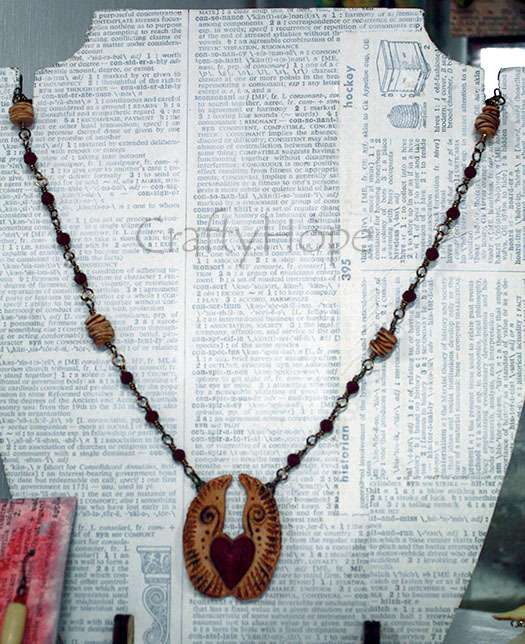 Actually, I'm just going to share the necklaces I currently have featured in my booth at Southern Antiques and Accents. I tried to pick ones that had a Valentine/Mardi Gras/coming Spring vibe to me. Also, I've got a bunch of news and dates about the shop at the bottom of this post, so scroll down for that if you're just sick of looking at my jewelry. Here's my most Valentine-y necklace. Yes, because it has a heart. . . 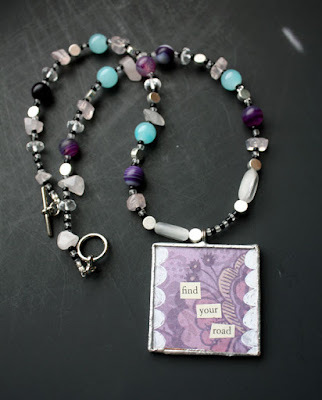 The polymer clay focal and stacked beads are from Tree Wings Studio. 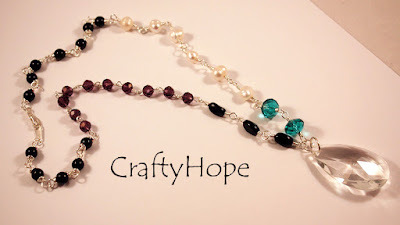 The other beads are a deep crimson faceted glass and the wire is antiqued brass tone. This necklace feels very end-of-winter-melting-spring to me. 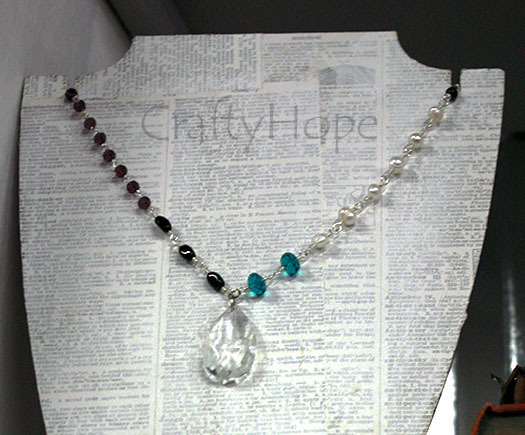 It has a chandelier crystal as the focal with freshwater pearls and glass beads making up the chain with silver tone wire. The picture above is from the booth and isn't very good. Here's a better one. As you can see better in this picture; the beads are blue, violet, black, and white. Yet another poor picture from the booth. 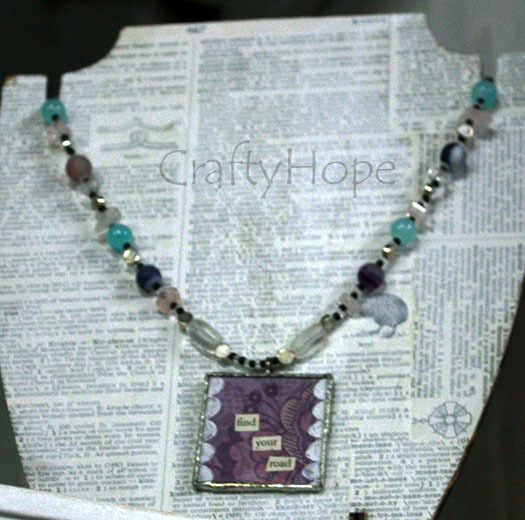 . .
Again, this necklace reminds me of Spring somehow. 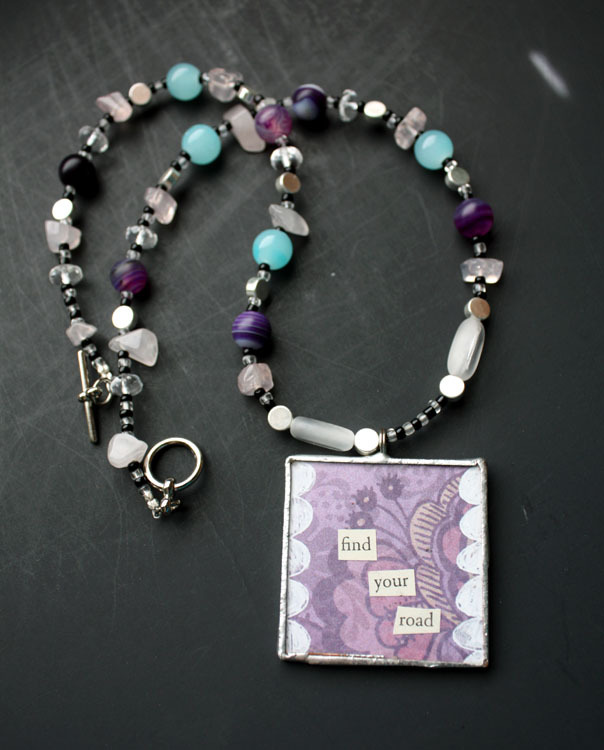 The words say "find your road" and the backside has a dictionary picture of an airplane. I collaged and soldered the focal myself. I'm letting this necklace be a slight nod to Mardi Gras and Spring. It contains two of the three colors of Mardi Gras with the green and yellow. The focal is made of three buttons stacked in a bezel that is backed with dictionary text. Antiqued brass tone wire was used to connect the glass beads. 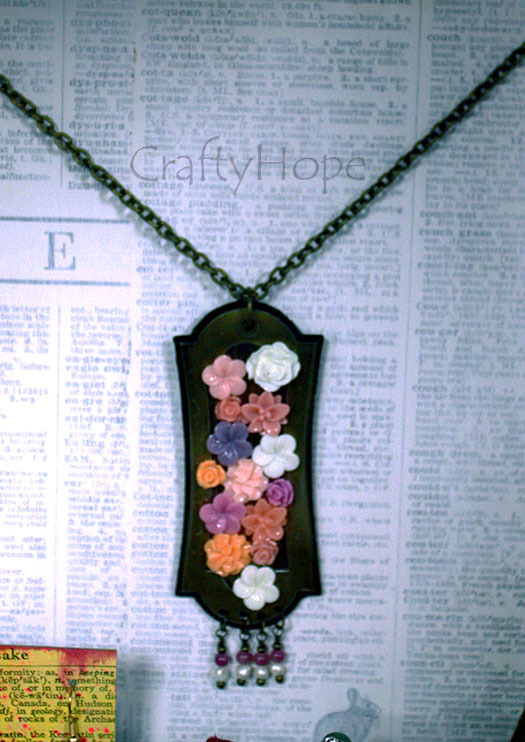 Finally, this necklace is ALL SPRING with its floral motif. The flowers are mounted on an upcycled piece of hardware. Freshwater pearls and stone beads hang from the bottom of the hardware piece. The chain is simply aged brass chain. Now for some news. . .This Saturday, February 6th, Southern Antiques and Accents will have its first Dollar Day. 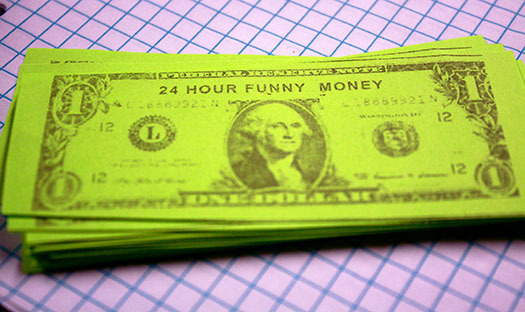 Booths throughout the mall will have items marked at only a DOLLAR! Look for tags like these to find the deals. Also, Ladies Night is on Feb 16th from 6-8pm. As always, there will be deals and discounts throughout the store (as well as a DJ). 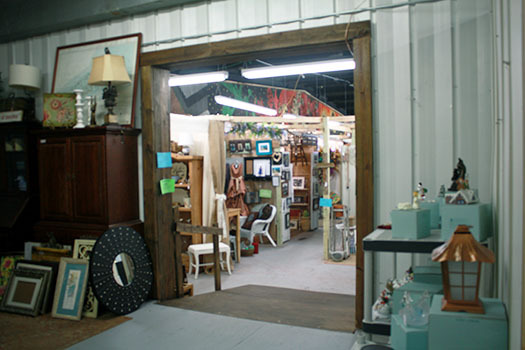 Southern Antiques and Accents is now open on Mondays. That means they are open seven days a week for your shopping pleasure. Lastly, if you haven't been by there lately, the store expanded. A wall was opened to add more booths. If you grew up in Fairhope, you may recognize the new portion as the old skating rink (the original portion of the store was the old bowling alley). 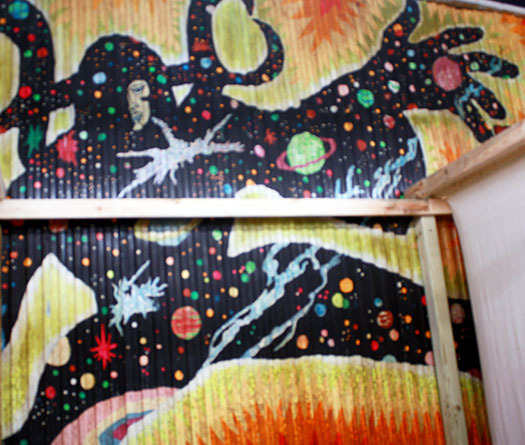 The owners have even left some of the psychedelic wall art on the back wall. I know this image was a flashback to his younger Days for Pat who spent many an hour circling under the black lights and cheesy music and passing this wicked space man. Anyway, back on track! If you're in the Fairhope area, Southern Antiques and Accents is located right off Greeno Rd (Hwy 98) behind the Pizza Hut. If you're looking for my booth, you'll find it directly behind the checkout counter. I'd love to know if you stop in and what you think! I'm cleaning out my email box and just found this. Graet job on your necklaces. The last one is my favorite. I love that necklace too. It's just so perfect for Spring!! Thanks for popping in!